A total of 716 discs were found. If there were hundreds of discs all with writing on them and the writing has been translated then what do all the other discs say? I have not found any mention of the contents of the other discs. Do you have more information on this? Feel free to contact me. 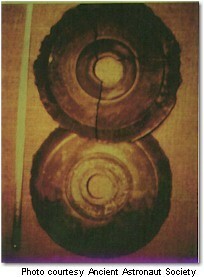 This picture of a stone disc is claimed on the internet to be one of the Dropa stone discs. However by comparing it's size to the chairs in the picture it is clearly larger than the supposed nine inch discs. In fact no picture purporting to be of the discs depicts them as having spiral writing on them. 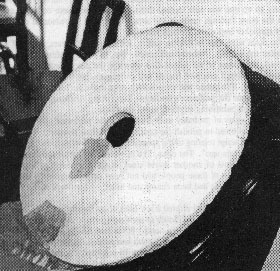 The finder believes that they were used in conjunction with the Dropa Stones as a form of radio communications with their home planet. These discs have circular markings on them but they are not spiral and lettering cannot be seen on them. /upload.wikimedia.org/wikipedia/commons/7/77/Dropa_1.jpg (site down?) Thanks to Sam Wilson for pointing me towards this photograph of a Dropa couple taken by Dr. Karyl Robin-Evans.